In keeping with my ongoing obsession with pretty parties (have you noticed all the wedding posts recently? ), I am super excited to have stumbled across the very lovely (and very useful!) blog Party Perfect. Chronicling countless picturesque parties, Sara Hicks Malone is angling to make herself a party planning guru. 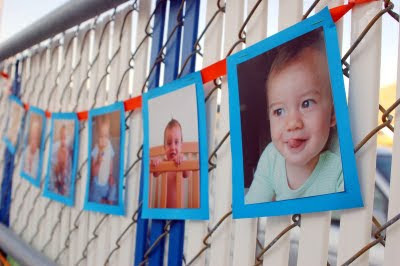 One of my favorite ideas, used for Tevi's first birthday, is a photo garland. Check out more shots of Tevi's party here, and Sara's blog here.